Fresh off a group watching of 'Naseeb' I was inspired to check out another one of Manmohan Desai's movies with 'Roti'. The man responsible for the venerable holy trinity of glorious/over the top 70's masala movies ('Amar Akbar Anthony', 'Suhaag' and 'Naseeb') did not disappoint. But not having his muse Amitabh Bachchan along for the ride didn't make for the all out insanity I was expecting although it was chock full of crazy plot twists, mathematically impossible coincidences and ruthless gangsters. 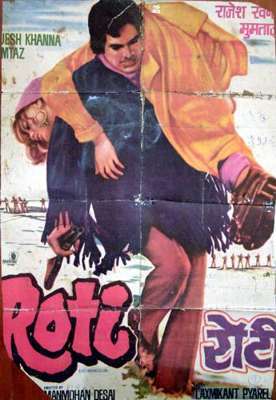 Mangal Singh (Rajesh Khanna) grows up as a criminal and through an unfortunate series of poor career choices he ends up being sentenced to hang for his deeds. Suffice it to say the plot really doesn't matter after this point as he gets rescued (for reasons that are still a mystery to me) by an underworld Don and ends up in a small village where he meets and falls in love with Bijli (Mumtaz). These evergreen Bollywood movies always stay golden for me not so much for the story but because I love watching the stars and grew up loving the soundtracks. Rajesh is not really that great of an actor but he consistently used my favorite singer Kishore Kumar as his playback voice and thus I have seen alot of his movies. Mumtaz though is another story - for those of you who have never seen her in her much too short career in Bollywood, you are truly missing out. She had 'it' whatever that is and that made watching her a true joy. And the fact that she could hold her own against the reigning superstar of the day showed that like her name in the movie (Bijli = lightning), she wasn't one to be messed with. Indeed, Rajesh and Mumtaz were actually good friends offscreen as well as neighbors in Juhu Beach. Khanna later recounted that he tended to be bossy with his female costars but could never get away with that kind of behavior with Mumtaz and loved working with her. 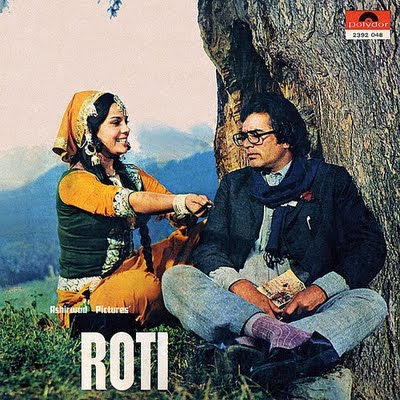 I think its a great movie Roti.